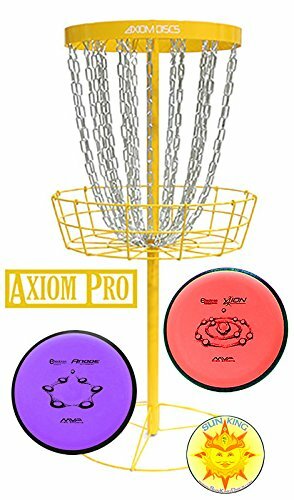 The Axiom Pro Basket is designed for the most realistic putting experience off the course, with the high visibility for which Axiom disc golf products are known for. This set includes (2) random MVP/Axiom golf discs in grippy Electron plastic and full color Sun King Discs sticker (see image), a $25 value! The discs will be putters or mid-range drivers in various available molds and colors. Features/Details: Six Seamless Matte colors available: Red, White, Yellow, Lime, Light Blue, and Orange. Electrophoresed first stage followed with tough powder coated outer shell for extra durability and protection. 24 high visibility zinc coated heavy duty course weighted chains 12 outer and 12 inner chains equidistantly oriented for zero weak pockets - reducing cut throughs and pole bounces PDGA Approved and built to standard PDGA height and size regulation. Sturdy all metal construction, all joints welded Uniquely engineered design - assembles or disassembles in under 1 minute. Compact easily transportable disassembled unit. Threaded tension connections for a sturdy assembly without any distracting wobble or play. Standard load distributed base. 2" tall header band - 25.5" regulation diameter. 21" outer chain tier diameter, 15" inner chain tier diameter. If you have any questions about this product by Axiom, contact us by completing and submitting the form below. If you are looking for a specif part number, please include it with your message.